Thanks for your feedbacks and comments about my littles silhouettes posted last week , I selected the 2 most famous ( from comments) of them : The mermaid ( #1 ) and the pregnant one ( #7 ). I started to work on both, but I immediatly get more attracted on all the new anatomical problem of the #7 , and started a speedpainting around to play with concept art, and find something I think good enough for the contest. 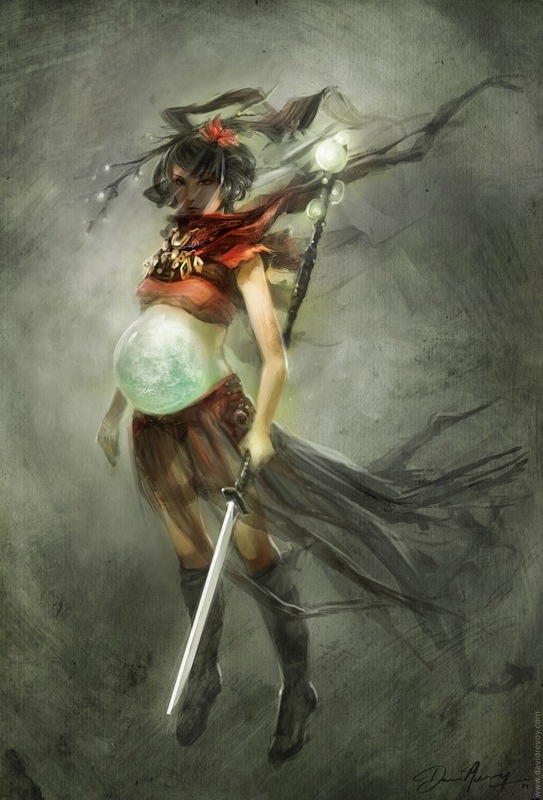 I painted a goddess pregnant of a new planet with a veil and a weapon. Within the other Dominance War gods, she's the one of the end of the world ... and born. That's why I choosed her name to be Apocalypse ( mean from Greek "lifting of the veil" or "revelation"). From the technical side of the artwork, I used only Gimp-painter. Doing veils and playing with transparency is a good exercice, as well as to find the good balance of color to show the planet inside her. Next step : Background, detailing and model sheet. License: CC-BY David Revoy, www.davidrevoy.com, 27 march 2011 . J'ai l'impression que la pliure du coude est un peu basse mais je me trompe peut-être. Le travail sur les transparences est énorme. nice job, great idea with planet! Very cool! A pregnant goddes, never heard of such one. :-P But what is in her hear? A sort of branch with lights on it? @Godzillu : Merci, bien noté pour le coude, à corriger donc pour ma mise au propre. @ Deburger : Thanks for the 2 comments ; I must add a texture to this veil on face to be sure it's obvious it's not a shadows. Thank for this indication. Looking really good. Must say this is really the right choice. quite interesting and original concept. Model Sheet o_O, OMG, will you be releasing that under CC? XD I'd really love to try and model her in 3D once it's done.